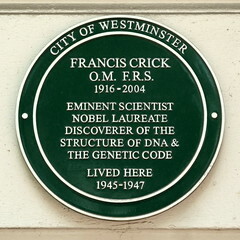 Francis Harry Compton Crick OM FRS (8 June 1916 – 28 July 2004) was a British molecular biologist, biophysicist, and neuroscientist, most noted for being a co-discoverer of the structure of the DNA molecule in 1953 with James Watson. 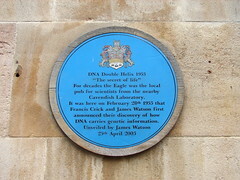 Together with Watson and Maurice Wilkins, he was jointly awarded the 1962 Nobel Prize in Physiology or Medicine "for their discoveries concerning the molecular structure of nucleic acids and its significance for information transfer in living material". Crick was an important theoretical molecular biologist and played a crucial role in research related to revealing the genetic code. He is widely known for use of the term "central dogma" to summarize the idea that genetic information flow in cells is essentially one-way, from DNA to RNA to protein. During the remainder of his career, he held the post of J.W. Kieckhefer Distinguished Research Professor at the Salk Institute for Biological Studies in La Jolla, California. His later research centered on theoretical neurobiology and attempts to advance the scientific study of human consciousness. He remained in this post until his death; "he was editing a manuscript on his death bed, a scientist until the bitter end" according to Christof Koch.